Edited by 65Gamerguy, Sat Nov 23, 2013 3:47 PM. The problem with the lower left corner is that the game always places the rock on a strip of the yellow ground that is only 7 pixels wide, i.e. the ground drops by one pixel as shown by the green pixel in all three of the CV examples above. If I were to put a red pixel in the lower left it would look like the attached image. Perhaps I can adjust the ground so it doesn't have the single green (i.e. transparent) pixel - but again I'm not sure how doable that will be. These appear to be single colour graphics - the same as the enemy ships that fly overhead. The "second" colour in this case is transparent so you see the background colour through the "holes" for want of a better word. Changing the colour code to a two coour code makes no difference, the transparent pixels remain transparent. I don't believe there is an easy way around this via hacking the rom but if someone knows how I'd be only too happy to know. @Gamerguy - nice looking rock that I'd love to implement but I am also restricted to an 8x8 image and not the nearly 16x16 used in the arcade. So makes it kind of tough to show a convincing rock with a single colour and in an 8x8 grid. What format would you need? I've just been using Excel for now to get the look of the graphic and would then manually convert to hex. This has worked fine for me for the few images that I have been playing around with. I was referring to put the Black , using sprites, why hence the Flicker. I guess it depends on if these rocks are programmed as sprites instead of a background image. I admit that I am not a programmer just trying to help out is all. Edited by 65Gamerguy, Sat Nov 23, 2013 4:00 PM. The images I attached above are in png format - can you download one of them and use that? I admit that I am not a programmer just trying to help out is all. Neither am I I really do appreciate the suggestions so please don't be put off if you have any others. I have attached a mock up I created of Moon Patrol. I realize it is probably not doable, just for fun. Hope you like it. Very nice mockup but unfortunately well beyond my skill level to implement. Attached is a rough work in progress rom file for your enjoyment. This contains a few errors and so a few things don't quite work right (these will be corrected in the final version). I am simply providing this so everyone can see the kind of progress being made and to see the new rock graphic in action. I still have a number of frames of animation to sort on the rock so it does flicker slightly. I would really appreciate feedback on what you think of this new rock graphic. It is a lot of work to change all of the animation frames and as such I'd like to get suggestions and make changes now rather than complete all of the frames and then have to change them all again. I also need to work on the double rock graphic and animation (i.e. 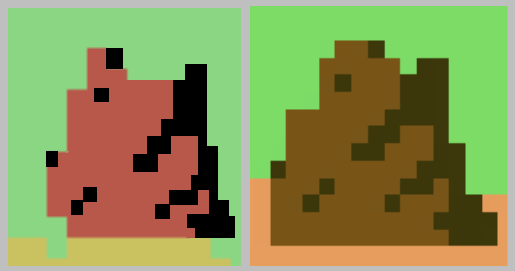 where two rocks overlap later in the game) - these are drawn as a separate set of animation frames. In this rom file I have also implemented changes to the enemy sprites to make them more or less identical to the arcade sprites - with the exception that they are limited to one colour. 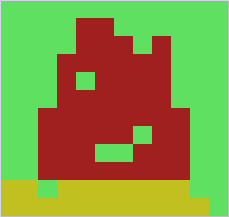 For the first red enemy sprite I have implemented the sprite suggested by Pixelboy. For the third enemy sprite I have not only completely redrawn the shape of the enemy to exactly match the arcade but have adjusted the animation to ensure that it appears to rotate clockwise in the same way the arcade version does. I have also changed the colour of the third enemy to cyan to more closely match the arcade colour. I have also adjusted the spacing of the two letter "o" in "Moon" on the title screen so they are now evenly spaced. There are other subtle changes. When I release the final rom I will also provide complete documentation covering all of the changes made. Something tells me that a CollectorVision CIB release will be coming soon! Nice job on the ROM hack!!! This is awesome! Ooh, another game for the Atarisoft folder on the Atarimax. Thanks! I like the changes a lot but the rocks are still red. They should at least be brown, I think. 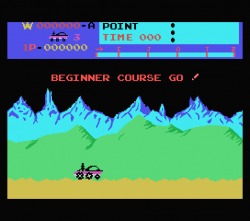 Moon Patrol in the intro screen should be slanted as in the arcade version, IMO. Otherwise, I like the color changes. Just my opinion. There's no brown color with the ColecoVision. The closest to brown you can get in the CV's palette of 16 colors is dark red. I like the changes a lot but the rocks are still red. They should at least be brown, I think. 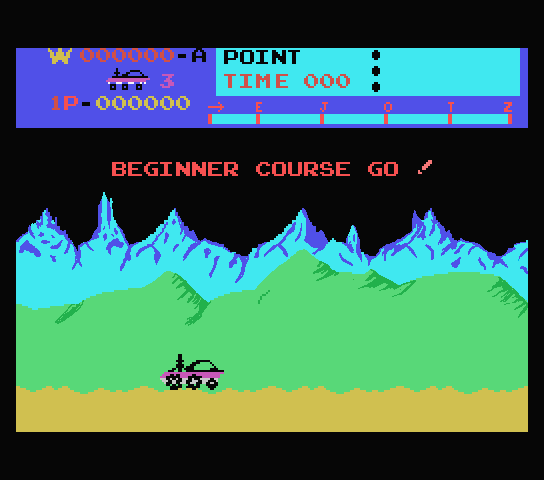 The rock is limited to one colour (with transparent holes that show green because of the colour of the hills behind the rock) and unfortunately the ColecoVision palette does not include brown. The only colours I can choose from are listed below. The rock colour is currently dark red which is a kind of muted version of the medium red. The medium red is much brighter and would make the rock look even less rock like in colour than the dark red. The light red is pinkish and definitely not rock like. I'm wondering how grey will look - perhaps more moon rock like. I'm trying to track down the byte that changes the rock colour but no luck so far - I'll keep on looking until I find it. Moon Patrol in the intro screen should be slanted as in the arcade version, IMO. I too like the slanted Moon Patrol that KevinMos3 created and may well switch to that. I also like the way that KevinMos3 increased the height of the "l" in "Patrol" to match the arcade. The arcade rock has a shadow on the right, going down to the left. Colecovision has one color with transparent. Since the transparent is lighter than the rock color, your sprite should treat the transparent as a highlight (opposite of shadow). You could try going from top left down to the right, or the same way as the shadow, but more to the center/top left. Great game that I like to see on any system! Can anyone help me track down the byte(s) that change the colour of the rock? I've searched and searched and had no luck and am on the verge of giving up. Found some more time to work on the rock design and animation. I have increased the height (by one pixel) of the first column of red pixels of the sprite to make it a little more dominating as it approaches the moon buggy - i.e. to make it look more of a significant obstacle. I have also adjusted the highlighting to come from the left as suggested by iesposta (thanks). So, attached are two animated gif files to illustrate the new rock. One has a single pixel highlight in the top right while the other doesn't. Which do you prefer, the first or second one? Any other suggested changes before I finalise this?